From Justin Timberlake’s joyous opening number to the shocking final moments of the telecast, the Jimmy Kimmel-hosted 89th Annual Academy Awards® was one for the record books. Emma Stone and Casey Affleck received Oscar® statuettes for their lead performances, Viola Davis and Mahershala Ali won for their supporting performances, La La Land realized seven six of their record-tying 14 nominations and Moonlight won Best Picture honors. 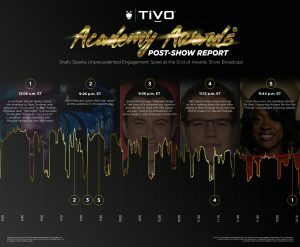 TiVo compiled the top five moments in which viewership spiked during last night’s awards ceremony. Those included Viola Davis’s eloquent speech*, candy falling from the sky, scenes from a Matt Damon feud and an epic eleventh-hour envelope mix-up. Without further ado, here are the TiVo top moments of the 89th Annual Academy Awards! 1 12:08 a.m. 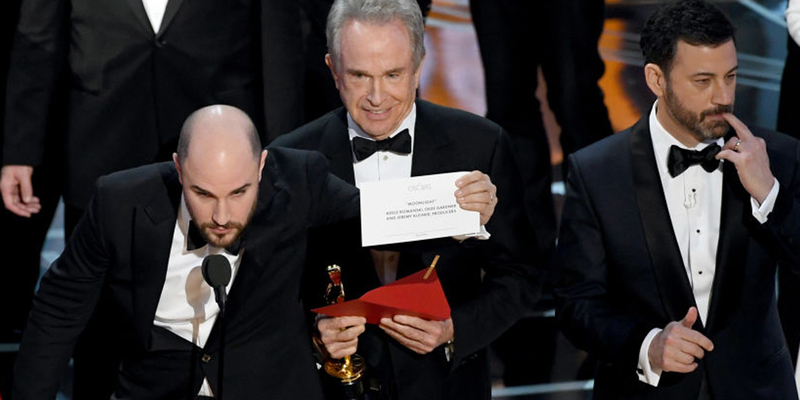 ET A confused Warren Beatty hands the envelope to Faye Dunaway, who announces La La Land as Best Picture. Moments later, Moonlight is announced as the Best Picture by La La Land producer Jordan Horowitz, who thought he had just won the award. 2 9:26 p.m. ET Red Vines and Junior Mints rain down on the audience in mini parachutes. 3 9:36 p.m. ET Jimmy Kimmel says Hacksaw Ridge is “the story of a conscientious objector who decides to work with Mel Gibson anyway,” during his introduction of Vince Vaughn, one of the stars of the film. 4 11:12 p.m. ET Matt Damon trips Jimmy Kimmel as he is walking down the aisle after talking to Best Original Song nominee and EGOT-chaser Lin-Manuel Miranda. 5 9:44 p.m. ET Viola Davis wins the Best Supporting Actress Academy Award for Fences and delivers a moving speech. *Note: Despite heavy focus on the unprecedented snafu at the end of the ceremony, Viola Davis and her speech were the #1 social and news trending item, according to TiVo Knowledge Graph data. We have compiled all this information and more into the TiVo Post-Show Report. 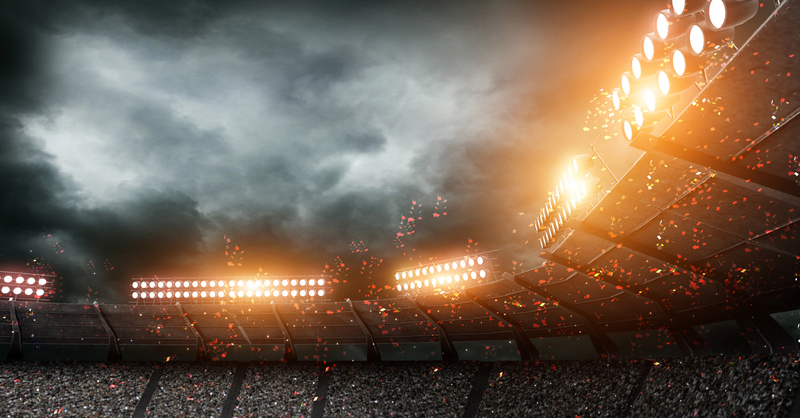 Click the image below to download it now. Academy Awards® and OSCAR® are registered trademarks of the Academy of Motion Picture Arts and Sciences and are not sponsored by or affiliated with TiVo.